The Port Cygnet Marine Conservation Area encompasses 103.1 hectares within Port Cygnet in the vicinity of Cygnet. The reserve contains an open estuary environment and includes a listed wetland of state significance. The reserve has significance as a potential scientific reference site for open estuaries as it is the only MPA in the Bruny Bioregion representing the Open Estuaries Biounit. The reserve is significant as a refuge area for numerous bird species including migratory birds such as Latham's snipe (Gallinago hardwickii), the Great egret (Egretta alba) and the Crested tern (Sterna bergii). The wetland harbours species such as the Pied oystercatcher (Haematopus longirostris) and White-bellied sea eagle (Haliaeetus leucogaster), which regularly feed in the area. The area is also a nursery and refuge area for sharks. Port Cygnet was first proclaimed as a wildlife sanctuary in 1952 for the protection of the foreshore and wetlands. 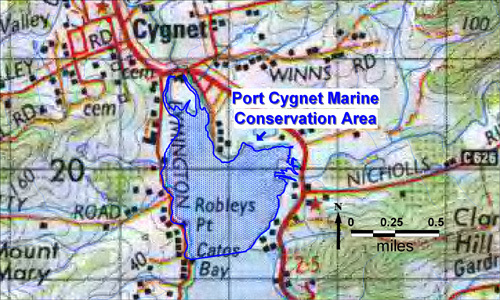 The marine component of the reserve area was proclaimed Port Cygnet Marine Conservation Area under the Nature Conservation Act 2002 on 9 December 2009. This reserve class provides for the protection and maintenance of the natural and cultural values of the area and the sustainable use of natural resources.